If you want the Doctor Who Christmas special of 2016 then you are in luck as this is the 2016 Christmas special on Blu-ray. 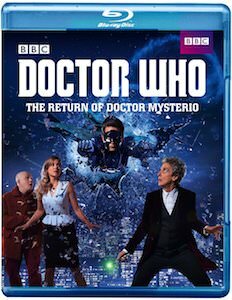 The Christmas special called “The Return Of Doctor Mysterio” is a great addition to you Doctor Who collection and can become part of your Christmas tradition. If you like Doctor Who and would like to see how a superhero gets made then this Blu-ray is what you want and it also shows that superheroes are great at normal jobs too. Don’t let this Doctor Who Christmas special out of your Doctor Who collection because it is great fun to see the 12th Doctor in another crazy adventure.